Users of Target Store's white label T-Mobile MVNO Brightspot Mobile are reporting that their data is being throttled when it shouldn't be and the company seems unable to fix the issue. It looks like there's bug that's affecting the way data is tracked on the $35 plan. That plan includes 300 minutes, unlimited texts and unlimited data with the first 3 GB delivered at high speed. After 3GB data is throttled to approximately 128 Kbps for the rest of the plan month. When the plan renews data is supposed to return to high speeds, which in the case of Brightspot means HSPA+ which can be as fast as 10-20 Mbps. The issue is affecting some, maybe all, users on the $35 plan. The data used counter is not being reset when the plan renews. Users can see this on their online account management screen which shows the minutes, texts and data used for the current plan month. For users hit by the bug, when their plan renews, the minutes counter is reset to zero but the data and texts counters aren't. When the data counter, which erroneously includes data from the prior month or months, hits 3 GB the users are throttled. There are multiple users affected by this bug which seems to have started around 7/26. There's a HowardForums thread about Brightspot with over 120 posts, the majority about this issue. There are at least five different users reporting the problem on HowardForums plus one on this site and another on Reddit. Users affected by the data renewal bug have has an extremely hard time getting it fixed. Of the five HowardForum's users only one "nspears" has gotten the issue completely resolved and that was only after going to the extreme measures of filing an FCC complaint, writing letters to Brightspot and Target RedCard Services and calling Brightspot support more than nine times. Another user, "oplb" called 7 days straight and finally got a Brightspot supervisor to remove the data speed throttle although his or her data counter still has not reset for two months in a row. User, "jellied" wasn't able to get the problem fixed and ported his/her number to another carrier and asked Target for a refund which was refused. HowardForums members exit88 whose had the problem since 7/26 and shamup who just got hit by the bug today when their plan renewed today are still waiting for a fix. Affected users who call Brightspot say they are told that a ticket has been issued and the problem will be resolved in 24 to 72 hours. However, not a single user has reported getting the problem fixed by reporting it and letting customer service submit a ticket. The two users who did get the problem wholly or partially fixed did so by going to extremes like filling a FCC complaint or refusing to accept the ticket solution and insisting to a Brightspot customer service supervisor that the problem be fixed right now. The Brightspot $35 plan would be a great deal if it worked as advertised. But based on user reports I recommend avoiding it until Target and Brightspot can resolve what looks like a serious breakdown in both customer support and the plan's technical implementation. If you are a Brightspot customer on the $35 plan have you have a problem with the data counter not resetting when the plan renews? If you have. were you able to get the issue resolved? Please leave a comment sharing your experiences. "effecting" (2x) should be "affecting"
"effected" (3x) should be "affected"
Hmm, the Brightspot coverage map shows only 2G in zipcode 27534. Where's the false advertising? Which denominations of GoSmart and Univision plans have you seen this on? I agree that it may be a T-Mobile MVNO handling problem. I had the same thing happening with PTel earlier this year. When I reported this, PTel resetted the data and my portal did not show any data usage for the rest of the month. It became normal from the next month's cycle. Boy, it sounds like some major hackers are going after Target pretty hard. It can't be coincidence having their credit cards hacked and now this. I suppose it could just be a bug, but I wouldn't just assume that. Targets reputation has really taken a hit this past year. I think it's very unlikely that hackers had anything to do with the data renewal issue. It is unlikely, but why would this issue affect Target only? I'm just curious to see how this plays out. The $35 plan is unique to Brightspot and is relatively new. I suspect there's a misconfiguration or bug in the specific portion of T-Mobile's account management and billing system that handles renewals for that plan. target wants to compete with walmart but target is failing badly. first, last year the huge credit card hack. second, this year the not so bright smartphone spotty plan that doesn't fully renew but instead turns your smartphone into a no-data dumb feature phone. This looks like a real good deal. I would consider it if it were on one of the other 3 networks (due to T-Mobile's uncoverage situation at this moment). To the "target wants to compete with walmart but target is failing badly" anon.... It appears, from the HSPA+ comment, that this is a TMO problem not a Target problem. Which would mean that Walmart has some form of it too. BrightSpot is a Target product so it's mostly Target's reputation that's at stake. Target handles BrightSpot's customer service and is responsible for managing its vendor T-Mobile. If the fault lies with T-Mobile, Target needs to do pressure T-Mobile to perform. Target also needs to fix the issues with Brightspot customer service which has been promising but not delivering fixes for over a month. They also should issue refunds or credits to customers who are not getting the service they paid for. Target did give me a $35 account credit with Brightspot, but I had to ask for it. Anyone know how to port out of BrightSpot? Yes! It happened to me as well! Three calls to costumer service did not help! Had to switch to net 10. This is very bad business from Target! I also switched from bright spot, CS was horrible, I'm now on Verizon and very happy with the coverage and consistency. How to port out of BrightSpot? I believe it's the same as T-Mobile Prepaid. Your 11 digit phone number (1-NNN-NNN-NNNN) is the account number. The passcode is your 4-digit PIN number (the same PIN used when calling customer service). Can you please confirm this with BrightSpot? Thank you. Is it possible to port from a T-MO MVNO to T-Mobile Prepaid? So if I port my number from BrightSpot over to T-Mobile's $30 walmart plan with 100 minutes, unlimited text/data, it will work? i did it, after 60days and $105 of service, except that i called customer service to request an unlock code for my lte phone. they said they would send it by e-mail but NEVER did. i had to activate the t-mobile plan using an unlocked moto g?lte phone, then switch the sim card into the t-mobile / brightspot locked phone . i too would recommend avoiding brightspot. I don't follow you. 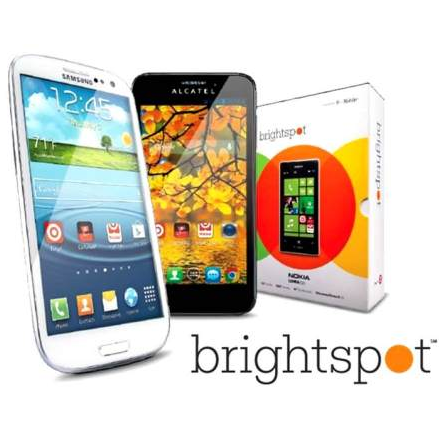 Brightspot phones are T-Mobile phones. A T-Mobile SIM will work in a locked Brightspot phone. I don't understand why you had to activate the T-Mobile SIM in a different phone before using it in the Brightspot phone. I have had the issue since July 17 and reported it constantly. A customer service rep told me I was a liar and hung up on me. I filed a report with the Better Business Bureau, but to no avail. My phone is currently showing 4G speeds, but they are saying I'm on 2G. Not sure what is going on, but nice to know I'm not crazy! I have had Brightspot service for two months, and have had to get my counter reset manually, even after renewing a day early to get my talk minutes back early. Fortunately the csr took care of the reset quickly and pleasantly, and since she.used a credit for a month of service/renew early to do it I am that much closer to a rewards card. Hope this isn't every month though. I have exactly the same problem today when I got my plan renewed. I called Brightspot, the csr was friendly but couldn't solve my problem as he had some problem communicating in English. However I got a call from his supervisor just a few minutes later, and my problem was solved swiftly. It is a little beyond my expectation since I heard that many people were having hard time with Brightspot. I will be contacting the FCC and the California Public Utilities Commission. I urge everyone to do the same. Another month. No data meter reset. The customer service person went the ticket number route. Because I have laryngitis I decided to give it a try. We shall see. I have called Brightspot 6 times so far. I keep getting it is in the process of getting fixed and I should see it fixed within 2 hours. Three days later still no resolution. Luckily, I'm not a heave user, but this is absurd. I asked for a free month and the customer service rep said they weren't offering that. I had her enter it into the computer anyway. Did complaining to the FCC help at all? Is this issue solved right now? has this been fixed? I was interested in switching over. It looks like the data counter reset issue was fixed 10/21. See the HowardForums Thread starting with post 176.